When The Man Who Came to Dinner went before the cameras in the summer of 1941, the Hollywood Golden Age motion picture studio was one of the most remarkable culture factories since the Renaissance studios of Titian and Tintoretto. And Warner Bros, in Burbank, was one of the most efficient of those factories. Several writers worked on the script, but work on the final version moved forward with the greatest script doctors in Hollywood, the magnificent Epstein brothers, Julius and Philip, a year away from beginning work with Wallis on Casablanca. Meanwhile, the astute Wallis talked to several directors under contract to Warner Bros It's certain he would have talked to the studio's workhorse, Michael Curtiz, who directed two others that year, and three the next, including Casablanca and Yankee Doodle Dandy. But the most intriguing possibility was Howard Hawks, fresh from Sergeant York, and who would go on to make To Have and Have Not at the studio. Hawks wanted to star Cary Grant in the film. Finally, William Keighley, a versatile, Curtiz-like craftsman, was chosen. Casting the plum role of Sheridan Whiteside proved to be difficult. Frederic March, Charles Laughton, and Robert Benchley were all considered, and rejected. Davis wanted John Barrymore; there's some evidence that Barrymore worked on the film, but by then, his alcoholism made it impossible for him to remember the many lines his part required. Finally, Monty Woolley, the star of the Broadway version of the play was deemed a safe choice; Woolley turned out be a hit with audiences, and went on to unique starring roles, most of them variations on his curmudgeonly Whiteside persona, into the 1950's. When The Man Who Came to Dinner was released in January, 1942, Warner Bros had both a distribution system and a major theater chain. Most of the Warner Bros 425 houses were in desirable urban locations, Warner Bros was particularly strong in Pennsylvania, New Jersey, Maryland, and D.C., and the film almost certainly played one of the Warner Bros houses in the Albany area. 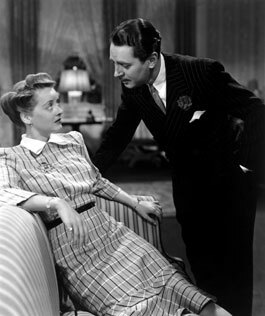 Warners also had substantial interests in British theaters, and distribution to 27 other countries, but the war had severely curtailed European and Far East markets, which may account for the increase in Americana like The Man Who Came to Dinner, Kings Row, The Male Animal, and One Foot in Heaven in Warner Bros production plans for 1941-1942. The Man Who Came To Dinner was one of a successful year of releases that would enable Warners to record 8.6 million in profits for 1942, the studio's strongest year to date. In a few years, it would be over. Attendance at the movies would peak in 1946, at more than 90,000,000 attendances per week, but television, growing families, and the exodus to the suburbs would all conspire to make the motion picture studio of the classical Hollywood period a dinosaur. By the 1947-1948 production season, the studios were already laying off contract players, and even stars became expendable. Bette Davis, the woman they had once called "the fourth Warner Brother," left the studio in 1949, her contract unrenewed. That year, the "Paramount decrees" of 1949 broke up what was left, forcing the studios to comply with anti-trust statutes by selling off their theaters and their production plants in Hollywood, leaving them as the distribution entities we know today. The great culture machine known as the Hollywood motion picture studio is no more, but, like traces in a cloud chamber, films like The Man Who Came to Dinner, witty, human, and hugely entertaining, remain to speak of a consistent richness of craft and a professionalism whose like we shall never see again.